Cut the rhubarb into approx. 2-cm/0.75-in. pieces. Combine just about half of the sugar, the vanilla sugar and the rhubarb pieces and let rest for approx. 30 min. in a baking dish. Top with raspberries. Preheat the oven to 190°C/375°C top and bottom heat. Dice the butter and combine with the remaining sugar and the flour with your fingertips to a crumbly dough. Coarsely chop the pecans and mix with the rolled oats and crumble dough. 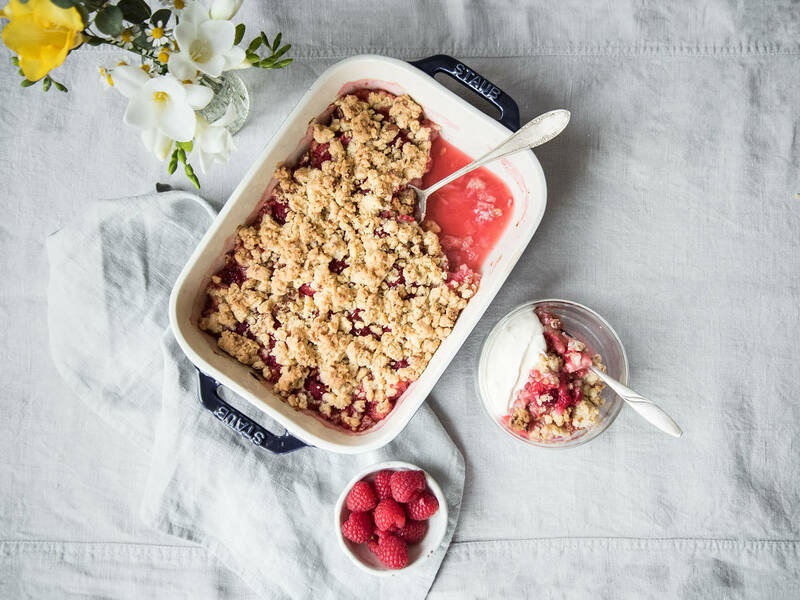 Sprinkle the rhubarb with the crumble and bake in the oven at 190°C/375°C for approx. 45 - 50 min., or until the top is golden brown and the top of the crumbles are crisp. Serve with whipped cream and enjoy!